Operators: Artseulov K., Sokolnikov L.
About public transport in Moscow. Bus rides to Kaliniskomu Avenue in Moscow. Tram rides down the street. 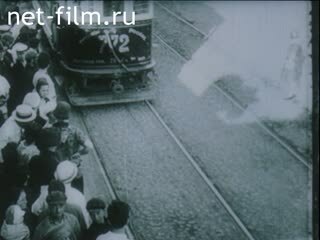 Newsreel 1910 .: Red Square, passing by the chaise. Directions tram on the street of old Moscow. The first cars on the streets of Moscow. Newsreel 1920's . : buses, pedestrians, traffic supervisor, trams go in different directions. 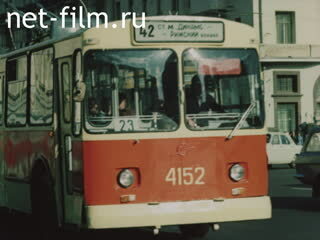 Urban transport: trams, trolleybuses, buses on the streets of Moscow. Reflection of the Bolshoi Theatre in the water fountain, PNRM. the bus rides background theater. Newsreel 1920's . : PNRM. at Theater Square. View of the Grand Theatre. Apollo's Chariot on the front of the Bolshoi Theater, departure to the general form of theater. Young people driving simulators focused person. Buses on the streets of Moscow. Traffic on the night street. The tram passes through an automatic car wash.
Medical examination, measures the pressure girls driver of urban transport. Mechanic listens special device noise of the engine. Measure the pressure male drivers of public transport. Trolleybus prepared for flight, is connected to the electrical wires. Tram connects to the wire, leaving the depot. Feet of pedestrians crossing the street to "zebra". Newsreel 1920's . : pedestrians on the street. Passengers board the tram riding up. Hand controls the tram driver. Passengers will not fit inside, hanging outside the tram. A monument to Pushkin, departure to the overall plan. Close-up: traffic lights, lit successively green, yellow and red light. Close-up: autumn leaves of different trees. Passengers at the bus stop. Trolleybus rides past the New Theatre Arts Theater. Evgeny Davydov driver turns the steering wheel in the cockpit. Passengers on the bus stop. Evgeny Davydov says (synchronous and behind the scenes) about the profession trolley driver. Trolleybuses on a background of new buildings in Moscow. Passengers in the cabin trolley. Evgeny Davydov in the workplace. Drivers in the break room bus station, read newspapers, eat in the dining room. Tram driver Valentina Zvonareva in the workplace. Valentine says Zvonareva (synchronous and behind the scenes) about his profession. Tram rides in the area Tinkers quay. Buses and other vehicles going past the Kremlin. Passengers at the bus stop on the Kalinin Prospekt sit in the bus. The bus driver says (synchronous and behind the scenes) about the complexities of their work. View of the Manege Square from the cabin of the bus. Member of competition drivers traveling on the bus, carrying pieces and turns, circling the boxes placed in a special area. In the streets of Moscow travel buses, trolleybuses, trams. How to get past the Kremlin, Moscow State University. View of the half-empty streets of Moscow.